Medtronic MiniMed 640G Trial - Remote Bolusing | Life, Sport and Diabetes - An everyday look at my life with type 1 diabetes. Monday night I felt like I had reached a milestone in my Medtronic MiniMed 640G trial (that I was given to try by Medtronic for 64 days), because I bolused remotely for the very first time whilst out with my friends from my training squad from athletics. This was such a momentous occasion because diabetes has such a close relationship with food. But in British culture, food is so finely woven into social situations, that it can be a real challenge to be discreet about doing your insulin at the dinner table. This was especially something I found whilst on injections, that would cause people to look and stare whilst injecting out in a restaurant. With the pump that I had before this one, it used an audio bolusing system whereby you pressed a button on the pump when you didn't want to get it out, and it would vibrate to you when you had selected how much insulin you wanted to give. Which was good, but not very discreet because people often asked me why I looked like I was concentrating so hard. But it was because you had to listen and feel for the vibrations to see if the insulin had gone in properly. And of course it wasn't remote, because you still had to touch the pump. So if you had a dress on or a lot of layers, it was a bit tricky to do. However, with the Medtronic MiniMed 640G you can use the corresponding blood glucose monitor - the Contour Next Link 2.4, to remotely tell the pump to deliver insulin. I did this really discreetly whilst sitting at the dining table, by taking the monitor out of my bag, switching it on and selecting the bolus feature on the home screen. You can then use the up and down arrows to select how much insulin to give, confirm the amount and then send the information to the pump. The pump then delivers it and vibrates a few times to tell you that the insulin has gone in okay. I felt really pleased that no one even noticed at the table, it took literally seconds to do and I could get on with eating my gluten free pizza! (Well it is off season after all). 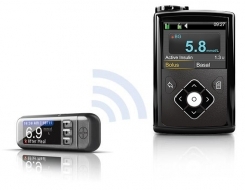 The Contour Next Link 2.4 not only wirelessly connects with the pump, enabling me to send boluses of insulin, it also tells the pump when you've done a blood test and sends the results to the pump for calibration. The device also has a USB hidden at one end, which is how you can upload information from the monitor and the pump to the internet, a pretty clever device if you ask me!